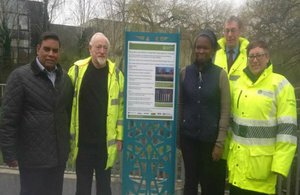 First phase of the Perry Barr & Witton flood scheme is now complete. On Friday 10 March 2017, the Environment Agency held a public event to mark the end of the first phase of works to help reduce the risk of flooding in Perry Barr and Witton. This is a key milestone in the £28 million, 2 phased flood risk management scheme that has been developed in partnership with Birmingham City Council and Sandwell Metropolitan Council. Once complete, the scheme will help protect approximately 1,400 properties from flooding from the River Tame. The completed first phase involved rebuilding existing flood walls along Brookvale Road and constructing new walls alongside Atlas Industrial Estate and Tame Road. Channel improvements have also been carried out to help the river flow more quickly through the area. We’re delighted for the residents and businesses that the work on the first phase has been completed. Today’s event is a great opportunity for partners and the community to come together and mark this important occasion. The next phase of the scheme involves increasing the existing flood storage area at Sandwell Valley Park. The site at Forge Mill Lake will see the construction of a new embankment to help control flows down the river during periods of high flow. A planning application is scheduled to be submitted in May this year with construction planned for early 2018.